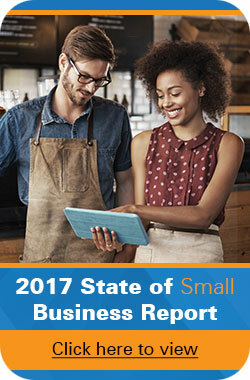 According to the State of Small Business report, an incredible 46% of small businesses don’t track their inventory or use a manual process to do so. Inventory and fixed assets are sometimes treated as assets on a company’s balance sheet, though not all assets are inventory. With these practices, it’s not surprising that about 1/2 of all new small businesses don’t survive past the first five years. Inventory and assets are actually very different things. Inventory is what is sold to make a profit, and assets are what help the company obtain, maintain and sell off their inventory. When deciding between a fixed asset or inventory management system, this difference is crucial to understand, particularly for brick and mortar companies. What’s the difference between the two? The key difference is that inventory is the materials, work-in-progress goods and finished products a company intends to sell to earn revenue. It is the company’s product, or it is a component used to create the company’s product. In order to stay in business, the company must sell inventory, send it into the distribution channel, or use it in production. Fixed assets, on the other hand, may be used in production of the company’s products, such as equipment or machinery, but they are not part of the company’s normal revenue stream or product line. They are rarely sold under a year’s time, unless the company is upgrading equipment or selling a facility or, in a worst case scenario, closing. Why is keeping track of inventory important? Inventory is considered a “current asset” by the company’s accounting team, which means that the company plans to sell the asset in the short term. Over time, some inventory may become obsolete, or there may be too much on hand to sell within a reasonable period. An inventory system must include the ability to identify excess and obsolete inventory so that the company can adjust for this slow moving or non-moving inventory. Conversely, if your on-hand inventory is too low, you may lose sales due to inability to meet demand. This is where knowledge of your inventory turnover ratio comes in handy. Why is keeping track of fixed assets important? Fixed assets, also known as hard assets, are considered long-term assets on the balance sheet. This means that the company expects to profit from use of the asset for a long time often referred to as its useful life. However, fixed assets do have a finite useful life, and accountants must record the decline in usefulness (the assets’ value) by recording periodic depreciation. Over time, each asset’s value is reduced, but financial statements will continue to use the original cost of the asset rather than its current market value. To know how much value your assets are worth at any given time, you’ll need a tracking system. What do inventory tracking systems account for? There are several reasons to track inventory. One important function is to monitor sales. Inventory tracking systems can follow your products as they move in and out of stock or production, as well as when they sell it in order to calculate the cost of goods sold. You can also ensure the safety of your inventory (via surveillance or alarms) and maintain your inventory turnover ratio by ensuring the accuracy of your databases and eliminating excess stock. Unlike fixed asset management systems, inventory systems normally do not include the ability to plan and schedule maintenance on items in stock, even if such items would normally require periodic maintenance while they are in service. For example, companies that sell machinery and equipment don’t perform maintenance on the equipment in inventory, despite recommending that customers who use the equipment maintain it regularly. Equipment in inventory is not in use for its intended purpose, so it does not require maintenance until it is sold and the customer begins using it. What do fixed asset systems need to track? A fixed asset system must have the ability to calculate and record each asset’s depreciation. The best fixed asset systems have multiple depreciation methods they can use to calculate periodic depreciation. The most common depreciation method is known as straight-line depreciation, which is the initial cost of an asset divided by its useful life. Other methods include double declining balance and sum of the year’s digits. To combat depreciation, fixed asset management systems should have the ability to track required and preventive maintenance on equipment. This allows companies to plan and schedule necessary repairs, calibrations, and tune-ups to equipment; thereby prolonging the useful life of its assets. Fixed asset systems that include enterprise asset maintenance answer this need. Finally, fixed asset management systems can monitor the check-out/check-in process of said assets according to company policy. Examples of fixed assets that can require a check-out/check-in process include durable tools or equipment such as computers or projectors. 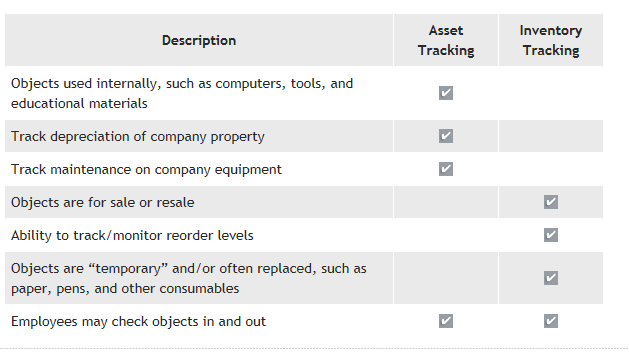 When fixed assets that go through these processes aren’t properly tracked, they can become lost, stolen or otherwise unprepared for use when needed. Private companies and the public sector alike can benefit from a centralized database that automates the tracking process. When selecting a system to manage your company’s assets, it pays to understand whether what you own consists of consumable inventory or fixed assets, even if some of the processes and terminology are the same. You should never overlook the importance of maintaining records of these assets. It may be helpful to work with a solution provider with expertise in both types of applications so they can discuss your company’s specific needs and guide you to the correct system. If you need help picking the right system for your business, call Wasp Barcode at 866.547.9277 and we will guide you through the process and make sure you get a system that right for you application. How will differentiating between assets and inventory help ensure accuracy on your company’s financial statement?